Designs by Lisa Somerville: Bloggers Challenge - Think Spring! Bloggers Challenge - Think Spring! With Spring just a day away - I thought the perfect challenge for this Friday's Bloggers Challenge would be - Think Spring! 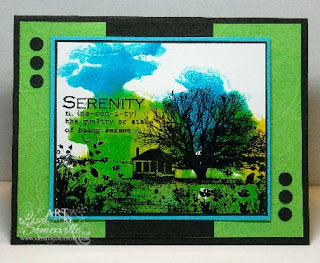 I'm using one of my favorite stamps from Artistic Outpost - Serenity. The main image was stamped in Black Archival on Glossy card stock - to add color, I used the Reinker Splash Technique, using reinkers in Turquoise, Yellow and Green. I ran my Green and Black panels through the Big Shot using my Texturz plate, to add some dimension to the panels. This is pretty. Those colours are so beautiful together and the composition of this card works so well. The reinker technique almost makes it look like there's a spring thunderstorm rolling in over the farm! Beautiful card!!! Very pretty! Great spring colors! Wow, this turned out so pretty! I love that "sky" you created, great colors. Wonderful card. So vibrant and rich looking. Love the colors you used. love it - Lisa - I wish I had your talent! The background behind the stamped image is beautiful. It highlights the image perfectly. I love the background!! What a fabulous technique!! Gorgeous as usual Lisa! Love the colors and the textures. Love the brillance of this card and an awesome technique to show case spring. This is stunning! The reinkers are perfect for this image and look great!!! Great card. Love the tech.